As most of you know from previous posts, I find inspiration in so many places, but one being other bloggers. I love the fact that we can connect to so many diverse and “Chique” people from all over the world via the web. This week I am excited to participate in a first time “Link-up” with other fashionable, stylish mom’s out there. They shared their style secrets, so now here are a few of my own. As a Pilates Instructor, Personal Stylist & Mom, I seriously do “wear” several hats so I need my wardrobe to be versatile. One single day could consist of school drop off, private Pilates session, stylist client, J. Hilburn appointment, followed by swim team practice. This means several wardrobe changes in one day. Regardless of where I have to be, I always add a dash of “chiqueness” to every outfit. When I am working with a client, we always create a “style statement” that helps them remember the image they want to project. For me, I want to be unique with a mix of modern and a touch of hippy “Chique”. I went from a high level executive job at Saks wearing designer duds and high heels to American Girl Place where “all black” was the dress code. Now that I work for myself, on top of being a full time Mom, I think my true personal style has emerged. There are rules, no color restrictions, but that also means no employee discount, plus, I am on a budget these days. So with that said, I now need to get creative with my wardrobe. I mix it up by pairing my high end luxury items with my Target denim or my thrift store scores. I love to change my look with the seasons, which makes fashion fun. Don’t be afraid to take risks and be bold! I tend to get overheated when going from place to place, which is why I love to layer. Then I can just shed a piece when necessary. For my shape, I need to add volume at the hips to balance out my broad shoulders. I do that with skirts or dresses over pants. On another note, I always try to cover my rear in skinny jeans! Also, when in doubt add an accessory. Last but not least, my other favorite tip is too wear bright lip gloss, big sunnies and a hat. No one needs to know you didn’t do your hair or put on mascara! Do you have any style secrets to share? 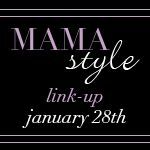 Join in on the fun and visit Ascot Friday for more details on the Mama Style Link-Up. Until next time, stay “Chique”. oh man i so wish you lived in Dallas…i would have you come style me in a second! !